Korean cult leader of The Family Federation for World Peace and Unification, Hak Ja Han Moon, recently donated over $50,000 to four American organizations that serve war veterans and their families. 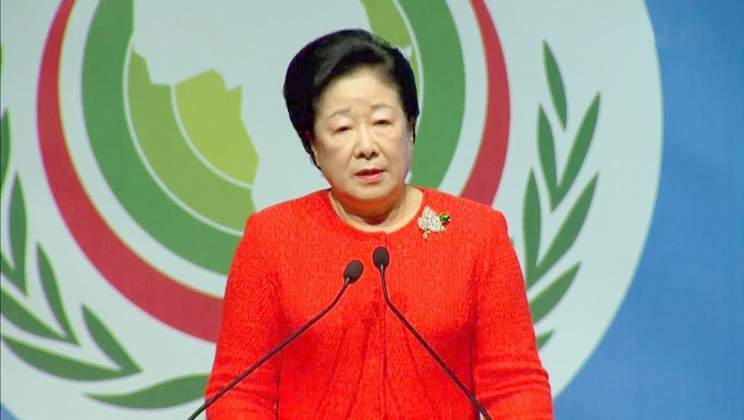 The Korean cult was in the country in November where Mrs Moon was supposed to address a crowd of 100 000 people at the National sports stadium in a bid to expand the wings of her cult. The media put much pressure on the church and the political leadership and the event was snubbed even by the President Emmerson Mnangagwa who was supposed to be the guest of honour. Sources who were in the organising team revealed to us that Moon was supposed to donate money to Zimbabwe war veterans, church institutions and other charity organisations but ended up not doing so after Zimbabweans snubbed her event. Veterans of Foreign Wars (VFW), Department of New York, a nonprofit veterans service organization comprised of eligible veterans and military service members from the active, guard and reserve forces. Union Cyber, a national nonprofit network for veterans that prepares men and women for careers in cybersecurity. Headstrong, a non-profit in the NY area that offers free, and confidential treatment for post-9/11 military veterans. They provide support and services by veterans, for veterans facing mental illness, PTSD, substance abuse, etc. Black Veterans For Social Justice, a nonprofit that assists military personnel in making a smooth transition from active duty to civilian life. They are dedicated to servicing military personnel, veterans and their families in the areas of social readjustment, housing, employment, compensation, disability, substance abuse, medical treatment, Post Traumatic Stress Syndrome, family intervention, prison counseling and relocation into the community, legal advocacy, discharge up-grade and redress of grievances within and outside the military. In Zimbabwe Moon was welcomed by Minister of Defence Opah Muchinguri-Kashiri and Deputy Minister of Information Energy Mutodi. Local Churches under the Zimbabwe Council of Churches (ZCC) discouraged the Christian community against attending the highly publicized Peace and Family Festival saying they do not identify with the teachings of the movement. President Mnangagwa and Gospel Musicians pulled out of Hak Ja Han’s Zimbabwe fiesta.